Coffee makers and grinders in one machine is another option that complicates the coffee maker comparisons and choosing, consumers have to dealt with these days. The evolution of coffee makers has come a long way since the invention of coffee and coffee makers. Customers demand and new innovations have resulted in the production of coffee makers and grinders with many features that make using them more convenient for its users. Some coffee makers are integrated with their very own coffee grinders, eliminating the need for a separate grinder. Although this is very convenient, can coffee makers with built in grinders perform as well? The debate of whether coffee makers and grinders should be in one machine is one that is ongoing. There is no real answer to this question. What we can only do is to weigh the pros and cons of having a coffee maker with built in grinder and having a coffee machine and separate coffee grinder in order to make an intelligent decision on which will suit the user more based on these findings. The number one advantage of having a coffee maker and grinder in one machine is without doubt its convenience. The coffee maker with built in grinder not only eliminates the need for a separate grinder, it also saves the user a lot of counter space, money and time. Most coffee makers with grinders have a lot of features that make it the ideal machine to use. It’s like having the best coffee maker - just put in the desired amount of coffee beans and set the coffee maker to work for you and it will do the grinding and the brewing on its own. Many people still believe though that the drawbacks of having a built in grinder integrated in the coffee maker far outweigh the benefits. 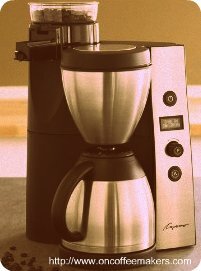 Coffee makers with grinders tend to be fussier than just your ordinary coffee maker. For one, if the grinder of the coffee machine breaks down, the coffee machine most likely won’t function separately. Another disadvantage is that coffee makers and grinders in one machine is bulkier than a regular coffee maker and also more difficult to clean. Moreover, it is more expensive than just a regular coffee machine and may cost as much as an espresso coffee machine. One of the biggest drawbacks however is that some users claim that coffee makers with grinders don’t produce a fine or even grind as the stand alone grinders. The reason why grinders equipped in coffee makers cannot produce even and consistent grinds is because it doesn’t have the compact body and weight to ensure the uniformity of the grind it produces. Given this predicament, technology has since made coffee makers with built in grinders better in their performance and have adjusted its flaws. Though it is still not able to give as fine a grind as a stand alone grinder, the quality of coffee grinds it produces has improved considerably, making it now only a minor setback. Technology and new innovations are expected to only improve the quality of these types of machines and might even make the need for separate grinders obsolete. So, yes coffee grinders and makers can and should be in one machine, but choose carefully to ensure that the grind quality do not suffer.